I've always been a true fan of the stage. As a child I loved attending the historic Coleman theater in Miami, Oklahoma. Often I'd watch my uncle, aunt, and cousins act and direct the great titles popular to "little theater" companies across the United States. I dreamed that one day I'd walk on that stage (or any stage for that matter) and move audiences to tears--to joy, to life--as I performed the iconic roles of Laurie in Oklahoma!, Glinda in Wicked, or Dot in Saturday's with George. I would have settled for Lucy in Jekyll and Hyde if it hadn't been for that one scene. I could have done that and still may if the opportunity came to me. When it comes to theater there's one thing that you must remember. It gets inside you. As Gene Kelly told Judy Garland in Summer Stock while speaking a grease paint and the theater, "That's one of the reasons I love the theater and everything it stands for. The heartaches. Excitement. The lights. The hockem'...everything." It's almost mystical, even magical, how acting and music can make a story came to life. The melodies take root in our minds and the emotions, the depth of joy and the pain of sorrow, find a place in our hearts. We leave that experience changed. Maybe you were bored to tears, but I'd say that if your open your heart to any story it will change you. 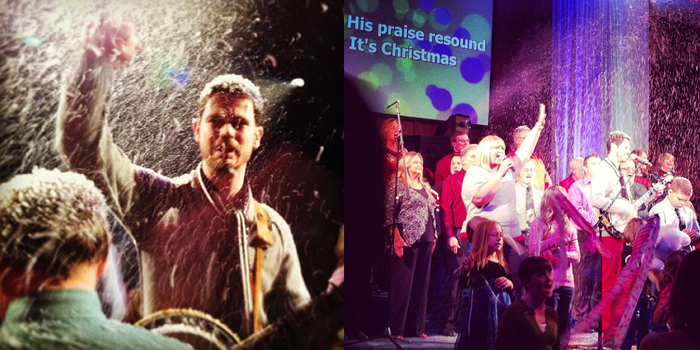 Looking at these pictures guides me to remember this moment...this second...when I shared Christmas with a congregation of 350 people. It was visible on their faces--the excitement, the joy, the togetherness that surrounded us. Ah, that moment. A glimpse into the depth of the power of an emotion...an emotion that led to an experience that can lead to a life change. For now, I'm singing for Jesus and if He chooses to use me to do something else then I'll do that, but this moment was...the best. Is there any play, musical, opera, or ballet that has riveted you?